Zelda spoke gentle coos to the mare while Rylan fitted her with the gear of a royal mount. The mare tossed her velvet black head with a snort as the cream-and-brown saddle came down on her back. “Have you decided on a name for her, Your Highness?” Rylan’s voice, a deep contralto unbefitting of her small, quick form, seemed to resonate from within her chest. The guard could certainly captivate attention with the simplest of words. She would have made a wonderful lady of the land: strong, self-assured, independent, qualities many of the ladies touting noble titles lacked. Zelda might have actually enjoyed her company in the court. Of course, she fit the title of Knight of the Royal Guard even better. Her sharp red eyes had told Zelda all she needed to know about Rylan before Rylan herself had admitted to it: she was a Sheikah warrior to her core, like Impa in the advisor’s youth. Born, bred, and proud. Both her parents had died in service to the crown, and now Rylan had chosen to carry on their honor as a royal guard herself. The mare snorted again and nudged Zelda’s shoulder with her muzzle. The princess smiled and offered up another slice of apple. Zelda buried her mouth in the palm of her hand, trying her hardest – and failing miserably – to smother her snickers beneath a facade of royal stoicism. Serious thoughts attempted to manifest in her mind as she struggled, only to peter out as she beheld the boy in front of her. Her breath shuddered out her nose in a staccato snort for several moments before she finally broke composure to burst out in a fit of uncontrolled giggles. The subject of her laughter blushed with a groan and pulled the rather ridiculous blue beret from his shaggy golden locks. “I look like an idiot,” Link grumbled, not meeting her mirth. “You look dashing!” she choked out, only half joking, yet still all laughter. “So ready to charge into battle to protect my name!” Next to her, Impa grunted her disapproval of the scene, mumbling about noble duties and responsibilities. Link growled and shook his head, cheeks as red as Din’s fire, and glowing just as bright. The uniform of the Royal Guard fit him so well, from the crimson undershirt, blue crested vest, and pointless white gloves to the needlessly tall white boots and dark pants to that stupid little hat. In it, he stood regal and oathbound, a knight of honor. And he was positively unthreatening to even a simple little cucco. She had always thought the uniform dumb, but he made it look particularly…amusing. She succumbed to another bout of childish laughter. “Are you ready to go?” she barely managed to say as she wiped tears from her eyes. “Awe, come on,” she pouted. He bolted, vest flapping in the wind, leaving her behind to laugh again in his wake. Well, at the very least, the princess would get the timing she wanted. 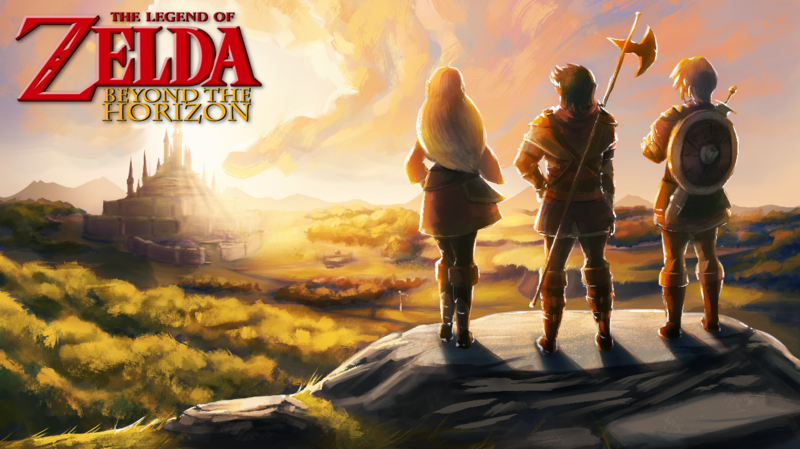 The sun hung high overhead, beating down upon the riders – and Link – with the vengeance of a thousand flames. Or so it felt. It didn’t help that, of the group of six, he was the only one walking, unfortunate enough to be forced to keep up with the pace of horses. His feet screamed with every step he took. Lady Impa and Rylan both had offered their mounts, but he had refused, a decision he now questioned. Still, the heat seemed to be getting to most of the group. Link glanced around, noting as the princess wiped her head and three of the four other guards shared a canteen. In fact, the only two showing no signs of bother were the two Sheikah; they rode in silence, eyes alert for any sign of trouble. Somehow, this did not surprise him. Relief was on the horizon, though, and fast approaching. The gates of Lon Lon Ranch drew nearer and nearer with every step, and Link willed himself to push through. Just a little farther. Secretly, he hoped the rest of the princess’s trip around the lands wasn’t so unseasonably warm. Last thing he wanted was to regret taking her oath, especially when her purpose was so pure and kind. Preferably someplace with shade. He took a swig from his own canteen and kept going. Soon enough, they stood outside the closed gates. At least a story high, they appeared to be made of oak, carved with charming designs of horses. Directly inside were a scattering of moderately sized buildings. A few stood on the left that, from the shape and design of the structures, appeared to be living quarters. As for the few on the right, from the occasional horse neigh or snort – and even more so, from the smell – they were clearly the stables. Looking down the warm dirt path between these structures, a few horses could be seen calmly trotting around inside a paddock. As the stable hands led them toward the main pen holding the horses, Link was surprised. He watched as a few ran around freely while others munched on hay on the opposite side. The collection of royal guards split off to oversee a couple other stable hands leading the caravan’s mounts into the pen. Zelda’s black mare reared back and knocked over a water bucket, much to her attendant’s dismay. Rylan immediately jumped in to soothe her. Link held back a chuckle. There was enough room to host another Knighting Ceremony within these walls; he nodded, mildly impressed. Plenty of room to run. They’ve definitely shown some care to these horses. Zelda waved her hand dismissively once more. They may not have known it, but Link could sense her annoyance. They apologized to a crown, not her. He resisted nudging her in a come on manner; Impa did not. Link, without a moment’s hesitation, took off toward the forest. He took a few seconds to catch his breath. Be back shortly, she said. It’s just a horse, I said… Link looked around the clearing, seeing if he could find any sign of a horse. In the back of his head, something seemed…off. The air felt still, as though there was something watching him. Eyes burrowing into the back of his head. A crawling just beneath his skin that raised the hair on the nape of his neck. And then, he heard a sort of cry. The telltale sign of a horse’s whinny. He moved towards the sound, cutting bushes in his way and climbing over a few mossy rocks. Before him, another small clearing and a draft horse, with a shiny chestnut coat and a cream white mane. This must be the mare. What other odds are there? The horse’s back left hoof was caught by a simple rope snare attached to the ground, and she kept pulling with her might to free herself. Link crouched low, slowly approaching with his arms out to show that he wasn’t hostile. The horse stared, unblinking, silent but tense. And then he heard something new. Something different. And something positively terrifying. A sound hidden behind the horse’s cries. A howl not of this world. He turned around to find that five wolves, hearing the mare’s cries, had not just snuck up behind them, but now bore down on the trapped creature and her rescuer.